Chinese telecommunications and networking equipment giant Huawei Technologies is partnering left, right and center at Cebit as it seeks to more firmly establish itself in Europe. Huawei derives around one-tenth of its revenue from enterprise products, with the bulk of the rest coming from mobile phones or carrier networking equipment. But the company has bigger ambitions for this segment. Germany is still a major manufacturing power, and one of the focuses of the Cebit trade show is the modernization of its industries through what the Germans call "Industry 4.0," a move to increase interoperability and real-time monitoring in manufacturing and distribution systems. "IT drives the transformation of the traditional industries, so this is a big opportunity for us," said Yan Lida, president of Huawei's enterprise business group. 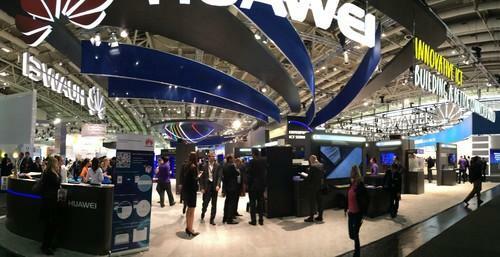 Huawei has a giant booth in Hall 2, where it is showing an extensive range of enterprise servers, storage and networking equipment. While HP has diversified from servers and storage into enterprise software, including analytics and security, and IBM has given up large swathes of the enterprise hardware market to focus on software and services, selling its PC and Intel server activities to Lenovo, Huawei remains resolutely focused on the hardware. "In this market, there is still a need for at least one hardware vendor," Yan said. That doesn't stop it taking a close interest in how its products are used to run the software: It is also exhibiting in a corner of SAP's booth in Hall 4, alongside Lenovo and Hewlett-Packard. The three companies are showing server configurations tailored for hosting SAP's enterprise resource planning software. HP boasts that around half of all SAP software is run on its servers, but that may not be the case for much longer, as the two Chinese server vendors clearly see a market opportunity here. During Cebit, Huawei signed a research partnership with SAP, under which it will host SAP engineers at its headquarters, and send some of its own researchers to work with SAP. "SAP is our global strategy partner," said Yan. Germany's biggest network operator also saw merit in a tie-up with Huawei -- in part as a way to reduce other vendors' hold over it. "Deutsche Telekom is reinforcing its vendor independence," the company said, announcing that its IT services subsidiary T-Systems will build cloud services for SMEs on Huawei servers. It's not all about Germany, though: Huawei also forged closer ties with U.S. software-defined storage specialist DataCore during the show, jointly launching a new range of certified hyperconverged systems based on Huawei's FusionServer range and DataCore's SANsymphony software. And last week Huawei opened a new center for fundamental research in Paris. The company clearly has big ambitions for Europe.